Claudius Ptolemy could be described as an ancient Roman renaissance man. He was a Roman citizen who lived in Alexandria, Egypt and wrote is scientific texts in Greek. He was not only a geographer but a mathematician, astronomer, astrologer, and even a poet. Ptolemy authored several scientific papers that resonated for centuries with many ancient civilizations including Islamic and European scientists. He authored three books with historical significance: 1) the Almagest (in; Greek, “The Great Treatise) on mathematics; 2) Geographia; and 3) Terabiblos (“Four Books) about astrology and phillosphy. In his work Geographia, written about AD 150, Ptolemy described and compiled all knowledge about the world’s geography in the Roman Empire of the 2nd century. 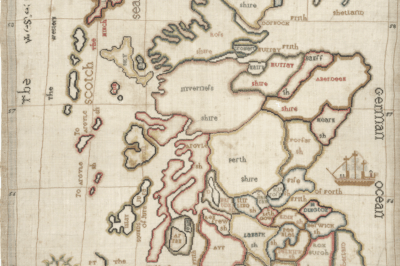 A substantial undertaking in scholarship of the day, Geographia was written in eight volumes. The first part discusses the problems of projections, that is, representing spherical item such as the earth on a flat sheet of paper. The second part included seven volumes and was composed entirely of atlas. One problem modern historians have encountered when researching Ptolemy’s work is that his works were all copied by hand and redistributed. 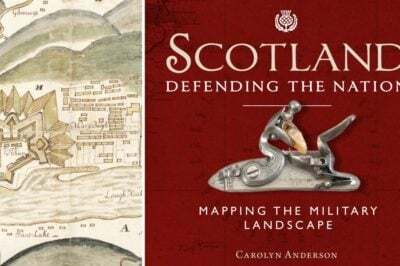 Many of his maps were not redrawn when copies were made and most copies known to exist today do not include his drawings; rather, the books include maps made many centuries later based on his descriptions or are missing maps altogether. One such source that points out this problem is an Arabian scholar by the name of al-Mas’udi who wrote around AD 956 that Ptolemy’s Geographia mentioned a colored map with more than 4,530 cities plotted and over 200 mountains. In Ptolemy’s world map he identifies many modern geographic areas including Taprobane (Sri Lanka) and Aurea Chersoneus (Malay Peninsula). 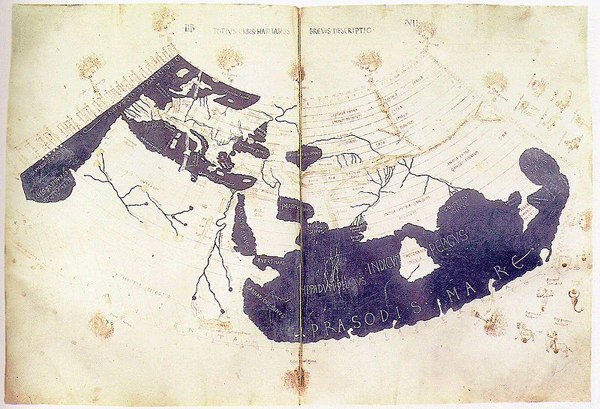 World Map by Ptolemy from 150 CE (redrawn in the 15th century). From the British Library Harley MS 7182, ff 58v-59. Like many ancient books and scholarly works, especially those housed at the Library at Alexandria, the work of Ptolemy was lost for over a thousand years in Western scholarship. At the end of the 1400s his work was rediscovered and translated into Latin, a more commonly used language of western scholars at the time. Geographia became popular once again and more than 40 editions were printed. The greatest contribution of Ptolemy was not the maps themselves but the concepts behind the maps. He offered three different methods of map projections and provided coordinates to all the geographic features he knew, more than 8,000 places. He invented the concept of latitude and longitude, a mapping system still commonly used today. Latitude was measured horizontally from the equator while longitude was measured from the westernmost landmass known to date, the Canary Islands off of the coast of Spain. Ptolemy not only mapped the known world but the known universe. He believed, and mapped, the Earth as the center of the universe. This geocentric model of the universe (also known as the Ptolemaic system) served as the predominant cosmological system throughout the ancient world, including ancient Greece and ancient Roman periods, until about the late 1500s when the heliocentric model of Galileo, Copernicus, and Kepler gained ground in the scientific community (but not necessarily the religious community of the Catholic Church). Ptolemy’s Geographia was a worldwide best seller of ancient times and was immensely influential for many influential explorers, most notably Christopher Columbus. Columbus was especially excited about Ptolemy’s exaggerated size of Asia and persuaded others to finance his journey with the expectation of riches from the relatively close and geographically expansive Asian continent. Of course, the reality of his journey was much different. The text of Geographia reached Europe from Constantinople around AD 1400. 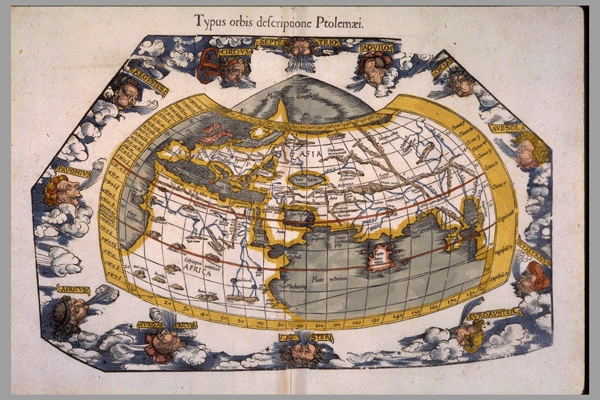 Ptolemy’s maps of the known world documented the Canary Islands to the Gulf of Thailand. Both Marco Polo and Christopher Columbus added extensively to Ptolemy’s maps based on their own explorations around the globe. In more recent times, interest in Ptolemy and his Geographia has renewed interest of geographers. In 2006, a new edition of Ptolemy’s Geographia was published in Switzerland, the first complete Greek text published since the 1840s. 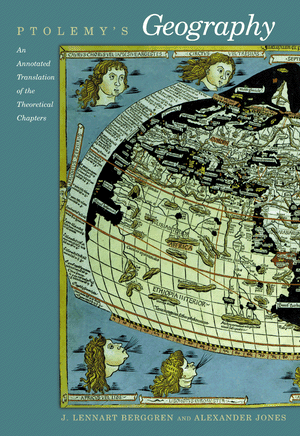 Copies of the book are now widely available for purchase such as the english translation by J. Lennart Berggren and Alexander Jones (entitled Ptolemy’s “Geography”: An Annotated Translation of the Theoretical Chapters .